Once a Desktop source is created, started, and the Desktop Integration Package (DIP) is deployed to end-user computers, you can manage remote DIP clients that are using the Desktop connector. This is done from the Remote Clients page in the Coveo administrator where you can rebuild, refresh, delete indexed documents, as well as delete and disable remote DIP clients. In the Collections section, select the collection that contains the Desktop source. In the Sources section, select the Desktop source. In the navigation panel on the left, click Remote Clients. In the Filter box, you can enter text to refine the displayed list of remote DIP clients. Example: Enter martin in the Filter box to only see clients whose name include martin. Select the check box of one or more remote DIP clients to which you want to apply an action. Select to re-index the whole content of local folders to index, even if nothing has changed. The rebuild takes place as soon as the remote DIP client is connected. In the meantime, the documents remain searchable. Select to only index modified, renamed, or moved documents. The refresh takes place as soon as the remote DIP client is connected. In the meantime, the documents remain searchable. Select to remove all indexed documents from the selected remote DIP client computers. Documents will not be searchable until they are re-indexed. 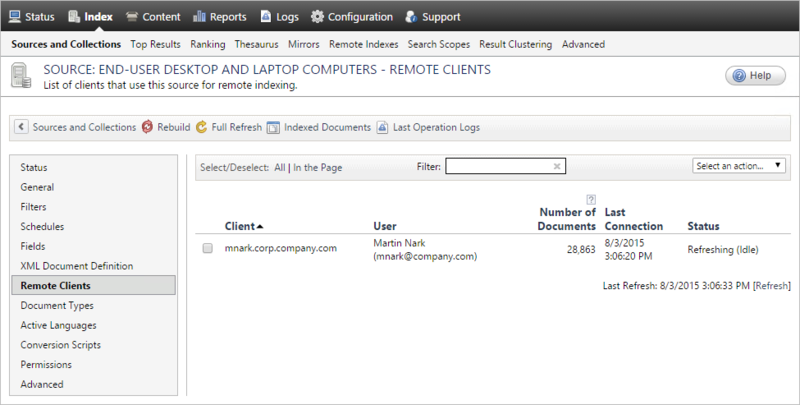 Select to delete the remote DIP client entry, document count statistics, and all related indexed documents. Select to prohibit a remote DIP client from indexing documents.